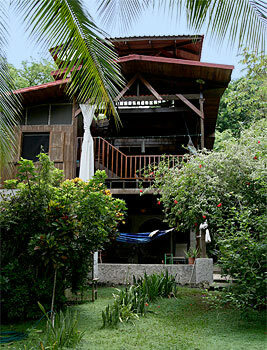 your dream holiday rental in the gorgeous tropical beaches of the Nicoya Peninsula, Puntarenas, Costa Rica. Click Here if you need a new code. 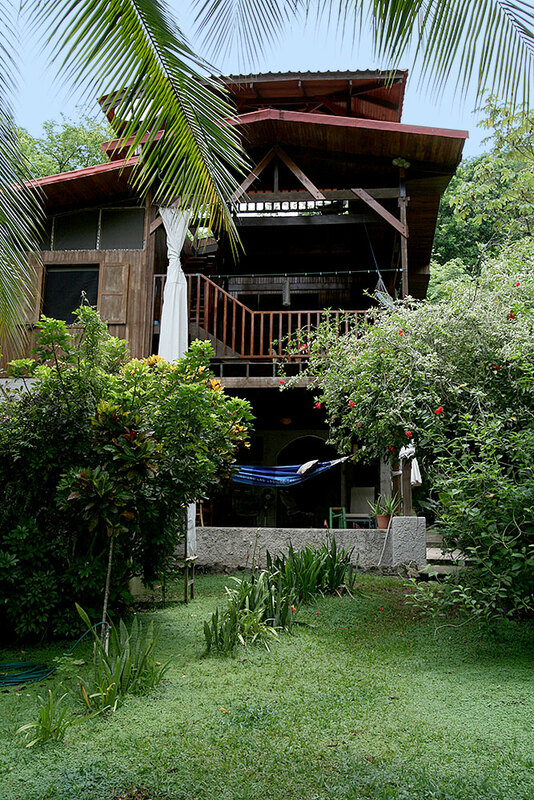 asa Montezuma is located 3 kilometers south of the town of Montezuma and 300 meters from the Gulf of Nicoya in the Pacific Coast of Costa Rica, tucked away in a serene grove of lush vegetation, part of a natural wildlife corridor. The area is well-known as a longevity and ecotourism hotspot. It is 5 kilometers north of Cabo Blanco Absolute Nature Reserve, Costa Rica's first natural reserve. This lovely three-story hardwood house is surrounded by tropical beauty, in the midst of what could be called a nature park. Monkeys, coatimundis, agoutis and anteaters often scamper through the 2 acre grounds, while toucans, parrots and eagles glide by overhead. Amazing butterflies feed on the exotic flora. All this, yet only 300m from the beach! The outstanding architectural design offers two stories of living space and an observation deck on the third level. 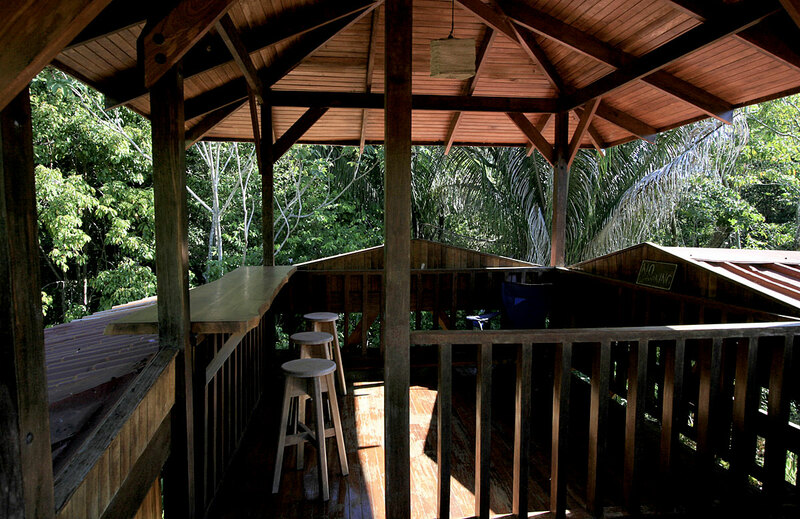 The observation deck is the place to enjoy your morning coffee as you watch the tropical animals and birds in the surrounding tree canopy. The house sleeps up to six adults quite comfortably, with three bedrooms and three bathrooms. There is an outside shower for rinsing off after the beach as well as an inside shower with hot water. Each floor has an open area to sit and enjoy the tropical trees and flowers. You'll feel the stress melt away as you listen to the peaceful sound of the stream that runs by the house. The wonderful layout of windows and doors offer great views and all are screened to invite in the fresh ocean breeze. Water is provided by a spring-fed well: pure enough to bottle and sell! A storeroom (bodega) offers a place to keep things locked up. Casa Montezuma includes free wireless broadband internet and SkyTV satellite television with HBO movie channels, as well as weekly cleaning service and two bicycles. Questions? Please contact us, we’re here to help! The Nicoya Peninsula is located on the west coast of Costa Rica, with the Pacific Ocean on its west side and the Gulf of Nicoya to the east. The northern part is part of the Guanacaste province and the south-southeast belongs to the Puntarenas province. The Cóbano district is located on the southern tip, belonging to the Puntarenas province. The Cóbano district includes the town of Cóbano, which is basically the business and commerce center of the area. This district includes several famous beaches such as Montezuma, Mal Pais, Santa Teresa, Manzanillo and Cabuya. Other nearby points of interest include Playa Tambor and Curú Nature Reserve. The Cabo Blanco Absolute Nature Reserve is located at the southernmost tip of the peninsula. This is Costa Rica's original absolute nature reserve. It is a thriving expanse of secondary growth dry tropical forest framed by gorgeous beaches. The town of Cabuya, just north of the reserve, features an island that serves as the town's cemetery. 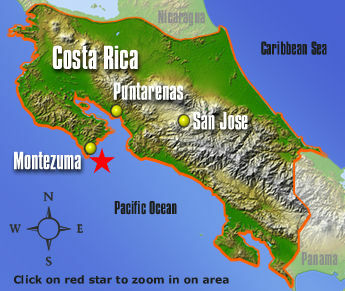 The town of Montezuma is located a few kilometers north of Cabuya. This town has become a famous ecotourism destination because of its wonderful natural setting and the bohemian ambiance provided by the town's artisans and colorful inhabitants. Its restaurants and nightlife have become very popular all over the world. The Pacific Ocean coastline of the peninsula features world-famous surf year-round. This includes the beaches of Mal Pais, Santa Teresa and Manzanillo. The area has also become famous for its nightlife and culturally diverse ambiance. There is a wide variety of gastronomic choices to explore and plenty of options for a refreshing beverage as the sun sets over the Pacific. The Nicoya Peninsula has been identified by Quest Network as one of the Blue Zones in the world; its people often live rich and happy lives well into their nineties and beyond. 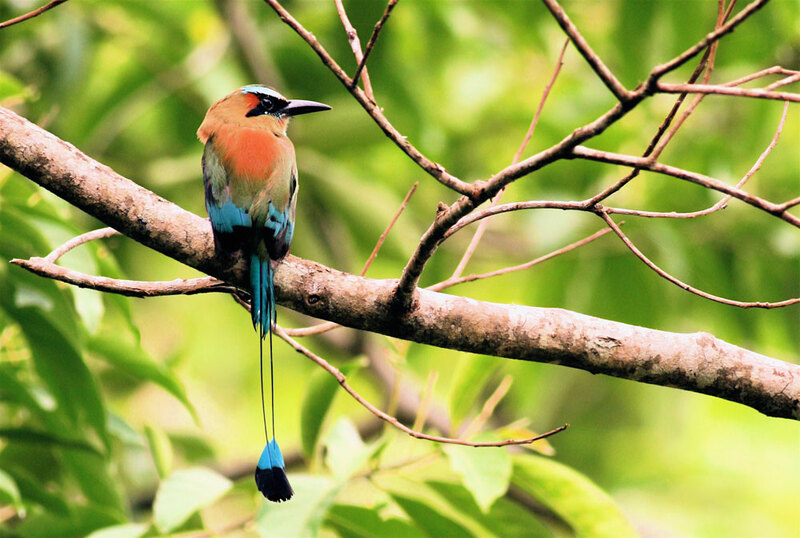 Casa Montezuma is committed to the preservation of the environment and the protection of the Nicoya Peninsula's biodiversity and peaceful culture. Our installations are designed to provide optimal harmony with our natural surroundings and to be as energy-efficient as possible. During your visit to Costa Rica, please support the Costa Rica National Parks system by visiting them. Your entrance fees help continue the successful effort to preserve the rainforest World Heritage.